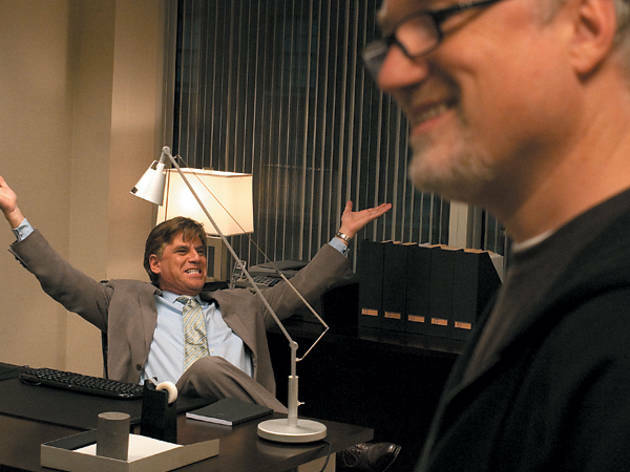 The Social Network scribe Aaron Sorkin gives us a crash course in the finer points of screenwriting. 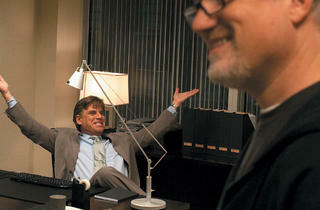 AN IDEA THIS BIG Sorkin, left, entertains Fincher. Talking to Aaron Sorkin, the man behind Sports Night, The West Wing, A Few Good Men and Studio 60 on the Sunset Strip, is exactly as intellectually bracing as you might expect. In the course of a 20-minute conversation, we talked about sock garters, classical dramatic structure, Edward Albee, mixed metaphors, Georges Seurat and the movements of a symphony, all of it somehow related to his script for The Social Network, which takes a hard look at Mark Zuckerberg and the creation of Facebook. Here’s just a sampling of his thoughts. I think that credit should really go to Jesse Eisenberg, David Fincher, Scott Rudin and Sony. There are a lot of people who would’ve insisted that if we’re gonna do this movie, that we begin with a scene of Mark Zuckerberg when he’s six years old being beaten by his father, so that everything after that can be forgiven…any behavior after that would be forgiven. The people I worked with…were not those people. They embraced the idea of writing a movie about a guy who is an antihero for the first hour and 55 minutes of the movie and a tragic hero for the final five minutes of the movie. When you’re writing a character like Mark, he’s got to be awkward. Is that a challenge for you? It is a challenge for me writing a character like that because the characters that I write tend to be hyper-communicative. With Mark, the way I dealt with that challenge is the way I would deal with [writing] a character who was drunk; I wouldn’t write them as drunk because drunk isn’t a writable thing. Trying not to expose the fact that you’re drunk is an extremely writable thing. So, I write the action, the intention. Don’t let anybody know that I’m drunk. With Mark, don’t write that I’m socially awkward. Write a guy who’s trying to have a conversation and everything to him is an obstacle in doing that. The history of Victoria’s Secret. Yeah. I’m really glad you liked that scene. I like that scene very much. I love Justin’s performance in it. I love the story. I love…[Laughs] listen to me loving my movie so much. Let me start by saying this: My parents took me to see plays starting from when I was a very little kid and oftentimes, I was too young to understand the story. I saw Who’s Afraid of Virginia Woolf? when I was eight years old. What I loved was the sound of dialogue. It really sounded like music to me, and I wanted to imitate that sound. There comes a place in the piece of music where instead of “ba-da-da-da-da-da-da-da,” we sit for a moment and a quiet thing becomes an aria. Just a simple story about Victoria’s Secret prompted by Mark saying, “Your girlfriend looks so familiar to me” is what turns into [a] “this is our time” speech. Which is designed for one reason: to convince Mark this is not a dorm-room operation; Mark, you’ve gotta get rid of Eduardo [Saverin, cofounder of Facebook]. But it’s working so well because of something you’re talking about, which is intention, right? There are intentions underneath. And I worship at the altar of intention and obstacle. I just like the sound of language as opposed to my friends who are writers who are all the guys who at summer camp were sitting around the fire telling stories. They’re natural storytellers. For me, plot has basically been this necessary intrusion on what I really wanted to do, which was just write dialogue.